Kanye West at his album listening party at Milk Studios last week in New York City. Rapper Kanye West experienced two births of a sort over the weekend. Most important would be the birth of his child with Kim Kardashian. Then there was the leak of his latest album, Yeezus, an event that also set the social media world atwitter. After months of speculation, the album reveals itself as a very trim, 10-song, 40-minute effort that's heavy on electronic and industrial influences. It's also another piece of the puzzle to one of pop music's most compelling — and frustrating — figures. Kanye's album may have just come out, but he's been performing for us for months now, whether rapping, stone-faced, on Saturday Night Live or telling the New York Times that he's a visionary like Steve Jobs or Howard Hughes. Most other artists would introduce a new song on iTunes or YouTube, but last month, Kanye debuted his single, "New Slaves," by simultaneously broadcasting its video on the facades of dozens of buildings around the world. Over the past five years, no pop artist has proved more adept at exploiting his or her own celebrity than West — and that's meant as a compliment. When the volume and pace of new music come at us like a torrent of sound, it's a remarkable accomplishment when an artist can grab our attention, even if only for a moment. No wonder West, with only a slight hint of irony, declares the following: "I am a God." If Kanye fancies himself a god, he's apparently an angry one. Musically, Yeezus comes off as the vengeful, demonic twin to the chill minimalism of his 808s and Heartbreak from five years ago. Both albums are steeped in electronic music, but while 808s was coated in a gleaming frost, Yeezus is a rusted saw blade. Befitting that dark, aggressive, industrial sound, Kanye's rhymes pack a vicious bite as he takes the weighty chip off his shoulder and swings it like a nail-studded bat. Everyone from talent agents to fashionistas takes a hit. But women bear the brunt of his crudest punch lines. There are few moments more brazen than "Blood on the Leaves." West manages to take "Strange Fruit" — a song, if you remember, about the lynching of black men during Jim Crow — and turn it against gossipy girlfriends, their sexual promiscuity and the cost of alimony. It's unsettling — and astounding — to hear Nina Simone's voice in the service of Kanye's convoluted sermonizing. But Kanye wouldn't be Kanye otherwise; Yeezus, like West himself, can be both annoying and enthralling. What makes him utterly fascinating goes beyond just what he says on record or does in concert; he has more or less elevated self-aggrandizement to an art form. 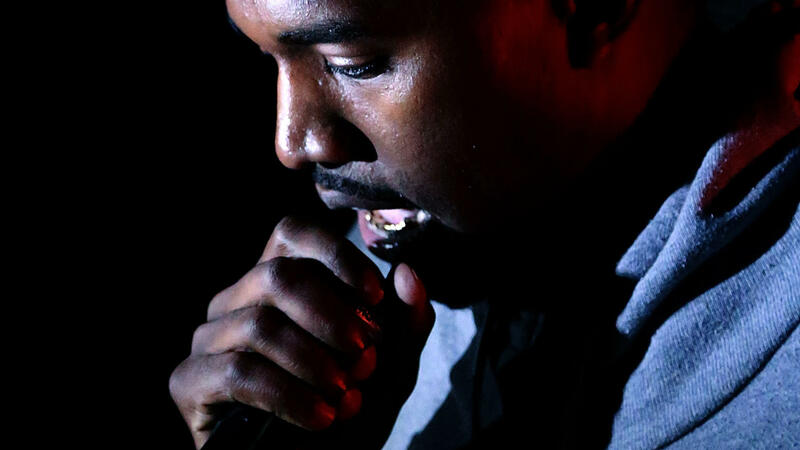 Yeezus was meant to be an event, and it's served that mission quite well. But it also feels like a single chess move — a crafty gambit on Kanye's part to keep us guessing as to what he'll do next. This is ALL THINGS CONSIDERED. Transcript provided by NPR, Copyright NPR.